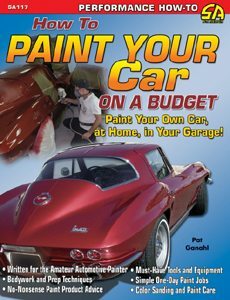 The paint job outlined in the last chapter is by far the most common, whether in professional bodyshops or in home garages. It’s the type I have done on the majority of my own cars. Now we’re going to take it further, by removing all glass, doors, trunk, interior, probably driveline, maybe even the body from the frame. Although this one isn’t over-restored like so many, and it does get driven, Jim McNiel’s historic Hirohata Merc custom is probably finished better now than it was the first time. It’s even won a couple Concours trophies already. But the body still hasn’t ever been off the frame. I did one paint job in which the car was completely stripped of interior, glass, driveline, and front-end sheet-metal, but the body was left on the frame and the doors and trunk were never removed. The reason these were left on (they were fully gutted of glass, handles, latches, etc.) was because they fit fine, had never been hit or removed since the car was built in 1953, and this vehicle was completely media-blasted, which removed all existing paint, primers, dirt, and so on, inside and out of all components. Removing the front sheetmetal and original driveline not only allowed easier installation of new front suspension and engine and transmission mounts, but also made it easy to modify, detail, and paint the fire-wall before anything else. Naturally there was a lot of trial-fit-ting of components along the way, but generally the process went like this: the firewall and body (including jambs, inside trunk, etc. 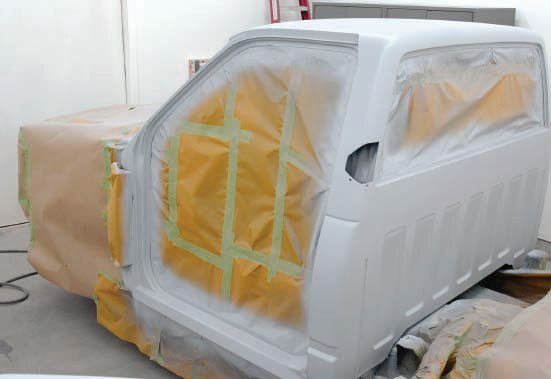 ), were painted first, along with the hood, front fenders, splash aprons, and so on separately. The dash and window frames were painted a different color to match the upholstery. All the painted components were color sanded and rubbed out. 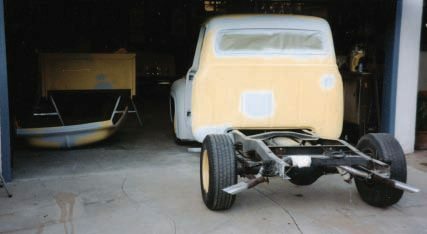 Then the frame was sanded and painted gloss black with spray cans, the underside of the floor-boards were similarly sprayed with black undercoating, and certain under-car and under-hood parts, such as the gas tank, were sprayed body color. Meanwhile the engine and driveline parts were assembled, painted, and detailed separately, and then installed. Next came all new glass, including rubber gaskets, channels, and felt strips, at a glass shop. Then the front sheetmetal was very carefully reinstalled and aligned, and all chrome trim, grille, bumpers, and so on were added. Finally, new gauges were installed in the dash, along with accessories such as air conditioning and stereo system. The car was fully rewired, and, last, the interior was reupholstered. I mention all this to present the steps of “building” a car in People often talk about “frame-off” restorations. That’s an incorrect term. I have one car, a ’32 Ford roadster, that will get a body-off-frame paint job when it’s ready. I’ve already had the body off the frame a few times. 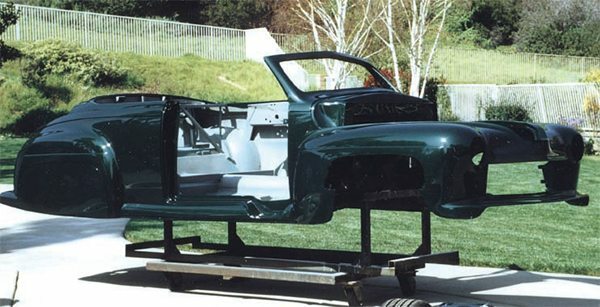 It’s no big deal with a car like an early roadster, and it’s the type of car that deserves this kind of restoration and paint. 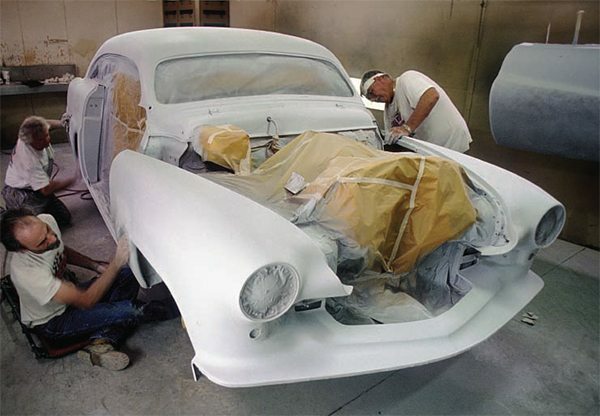 But I am not at all a fan of taking big ’50s-and–later car bodies off their frames just to paint them. It’s usually a waste of time and a huge amount of effort. More importantly, that’s not what this book is about. 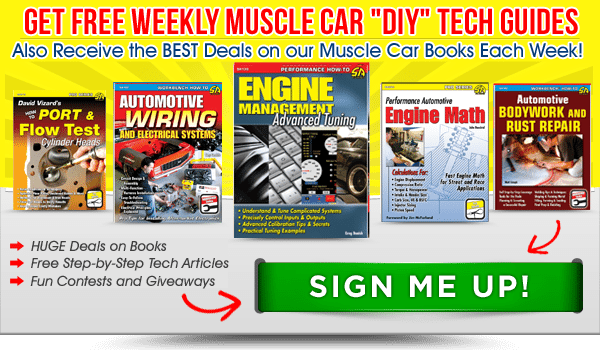 It’s about painting your car at home in your garage, so that you can do the quality of job you want, and save a whole lot of dollars doing it yourself. I doubt that your garage is equipped for removing full-size auto bodies from their frames. Which is not to say that you can’t do show-quality paint jobs, if you want to, right in your garage. Our example for this chapter is a perfect case in point. 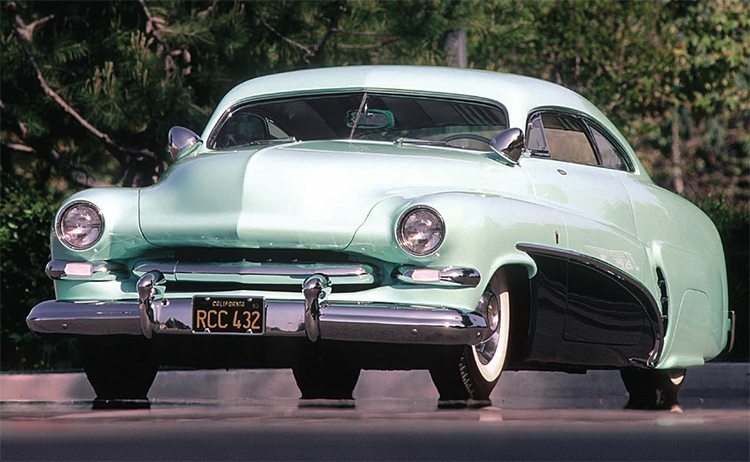 One of the most famous custom cars ever built, it won plenty of shows back in the ‘50s, and has won plenty more since being restored, and its body has never left its frame. 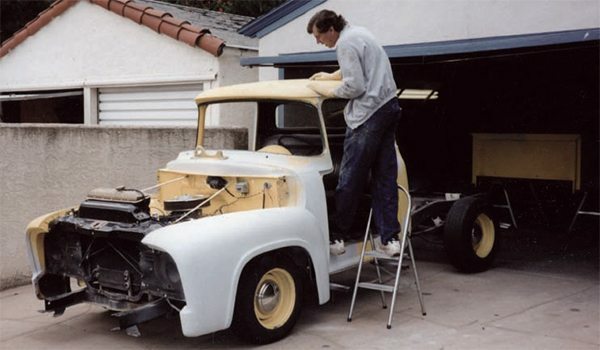 That’s when Hershel “ Junior” Conway, who began his illustrious painting career at George Barris’ shop as a teen, volunteered to paint the car, in original lacquers, in his shop in the short time available. With Junior steering and Jim helping, this is how the car looked as it left Jim’s driveway. 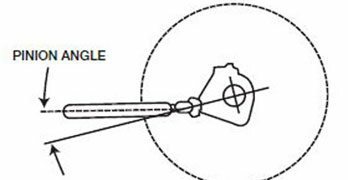 Despite the seemingly simple list of basic building/painting steps we presented in Chapter 1, we have already seen numerous cases where that sequence shouldn’t, or couldn’t, be followed. 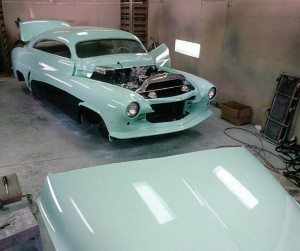 The restoration of the famous Hirohata ’51 Mercury, built in the Barris Kustom shops in ’52–’53, actually follows that recipe closer than it might appear. Longtime owner/keeper/restorer of the car, Jim McNiel, began by rebuilding the engine and mechanicals (painting and chroming parts as he did so). After removing all external trim, we showed the car being stripped to bare metal in Jim’s garage in Chapter 2. 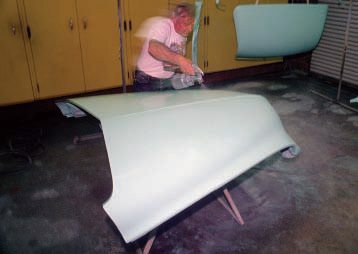 After he did minor bodywork, Jim etched, sealed, and applied several coats of high-fill primer to the body, block sanding several times between coats. That was the state of the car in this photo, in Jim’s garage, when time began running out for the car to be finished in time for a large museum exhibit. As soon as the car got to Junior’s, he removed the doors, hood, trunk, all window glass, and then masked off the engine compartment, interior, and even most of the undercarriage. The front fenders and splash aprons couldn’t be detached since they were welded and leaded to the body. Then, even though it had been blocked several times already, Junior added more primer and did lots more block sanding, with several helpers. Note the guide-coated door in the background. You can see that the rear window and side glass have been removed, with their custom moldings, but the headliner is still in place, so these areas had to be fully masked. Junior is carefully hand-sanding the side-window lip, especially in the tight corner where it meets the top. Several things here: Removing the doors allows access to the otherwise impossible-to-reach area around the hinges and inside the front fender. It also allows easy and thorough sanding of the jamb areas of the doors (which Jim is doing), as well as in the body. And you can see Junior spends as much time and attention sanding down under the rocker moldings as he does on more visible body areas. All this preparation makes the actual spraying of paint onto the body relatively easy. The reason Junior is wearing a simple mask is because PPG provided old-style (non-toxic) lacquer for this restoration. How he lays it down so smooth and glossy, I have no idea (other than decades of practice). A spray booth is not critical for lacquer, especially without clear, such as this. While he did the body and doors in the booth, he did the other parts in the shop, either propped on stands or hanging from racks. Jim McNiel acquired the once-famous Hirohata full-custom Barris ’51 Mercury from the back of a used car lot for $500 in 1959, where it sat forlorn and forgotten. During the next three decades, he did all the restoration work on it him-self, in his small, crowded, two-car garage, until an impending deadline for a big museum show convinced him to give it to Hershel “Junior” Conway for paint. 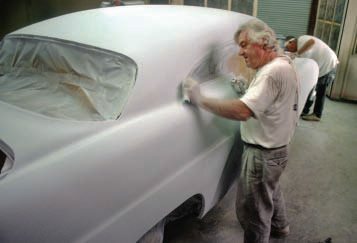 Con-way, a well-known and highly respected painter of concours-quality classics, who started out painting customs in Barris’s Lynwood shop in the 1950s, volunteered his space—Junior’s House of Color in Bell Gardens, California—to get the car painted in its original colors of hand-rubbed lacquer in time for the show. Jim had kept the car indoors for more than 30 years, so it was actually in very good, if well-worn, condition. 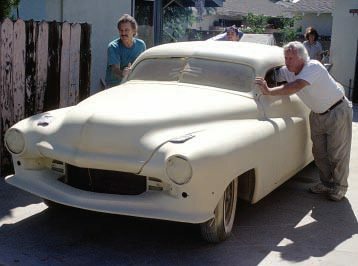 It did have four different paint jobs on it, but these actually protected the extensive custom bodywork, all done in lead. Inside, the car still had its original Carson and Gaylord white and green tuck-and-roll upholstery, along with the original, delicate Von Dutch pinstriping on the dashboard. Although the upholstery was worn, Jim wanted to save as much of this as possible. Jim had started by rebuilding and detailing the engine, running gear, and the chassis under the car. While he had the Cadillac engine out rebuilding it, he repaired cuts, dings, and dents in the firewall and inner fender panels, and painted them gloss black. He painted the frame with his regular spray gun in a semi-flattened black. Painting the engine the same pastel “ice green” as the upper body, which was an excellent contrast to the black engine bay, he reinstalled it and got the car running, and everything working properly, before turning to the external paint job. On a car like this, which was all still together in its historical original form to start with, this was a practical approach. At this point, the only things Jim had taken off the car were the hood, bumpers, grille, and most of the chrome trim, to have it replated or polished. Besides blocking primer coats, another key to glass-like paint—just as in the old days—is sanding with 400 to 600-grit (or finer) paper between color coats, which Junior is doing here. Note that even the door hinges are painted separately. We wanted to show Bill Larzelere buffing out the paint here to illustrate that it’s easiest (and cleanest) to do the color sand and rub out at this stage, when everything is apart and all masked. Whether it’s lacquer or catalyzed paint, however, it’s always best to let it dry or cure at least overnight before starting the rub out. Junior had to mask-off the upper body to spray the darker green lower panel. But once that was done, dry, and unmasked, Bill could rub out both colors at the same time, including inside the doorjambs. 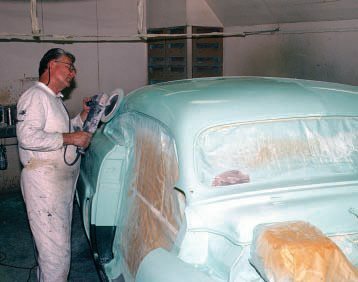 Next it was time to strip the many layers of paint off the car, which about six of us did in Jim’s garage, using “aircraft” liquid stripper with putty knives and small wire brushes, being very careful not to gouge any of the soft lead on the body (see Chapter 2). Jim spread cardboard on the floor to catch the drippings and flakes. 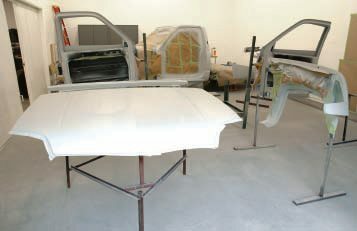 Once the car was stripped, Jim prepped the bare metal with an acid etch solution (Metal-Prep), and then some layers of high-fill primer (PPG K200 at that time), and began block sanding. But that’s when the show deadline began looming, and Junior said to bring the car over to his shop. Meanwhile, some tech experts at PPG in Detroit were matching carefully saved samples of the original two colors, and mixing them up in real old-style lacquer for this classic custom restoration. When the car arrived at Junior’s, the engine was in and running, the engine compartment was painted and detailed, and—though Jim had removed things like door panels, carpet, and all the trunk upholstery—much of the original interior was in place, such as the headliner, pinstriped dash, steering wheel, seat, and even the windlace. 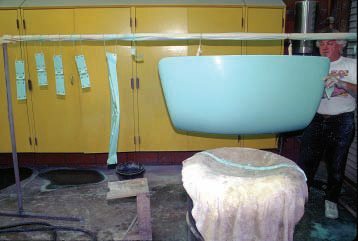 After being painted separately, each of the other parts of the car were also rubbed and buffed, including jambs and edges, before reinstallation. 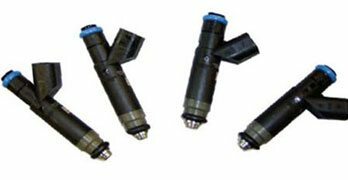 If you’re using a power buffer, be sure smaller parts, such as the fender skirts, are held securely so they don’t go flying across the room (don’t laugh, it’s happened far too often). As we say in the text, putting all the pieces back on the car after they’re painted (and especially after their rubbed out) requires extreme care, some helping hands, and preferably a good idea of how they reattach and adjust. If you took them off, you should be able to get them back on. Some protective tape around the edges helps, too. Now, you must understand that when a car comes into Junior’s shop for a “paint job,” (which costs well into five figures, total), it starts with a complete disassembly of the vehicle, stripping of the body to bare metal for metal-finishing (not filler bodywork), complete gutting of the interior, and so on. While Junior is prepping and painting all the sheet-metal, his helpers are doing things like having all the original nuts, bolts, and fasteners replated; all chassis and suspension components rebuilt and detailed; all rubber (or plastic) bushings, grommets, and so on replaced; all new wiring installed; things like steering wheels, gauges, and knobs rebuilt—everything. Most of this Jim did in his garage. 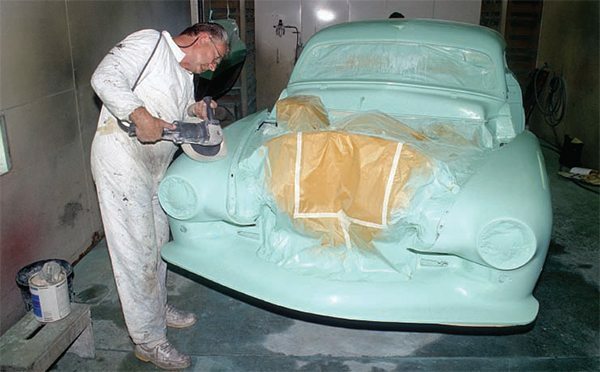 But once the car got to Junior’s, the paint job itself began with the removal of the hood, doors, trunk, and other body parts such as fender skirts and similar small items. The front fenders, splash pans, and other components on this car couldn’t be removed because they were molded into the body. But they also carefully removed the original glass and its custom-made chrome, rubber, or plastic frames. 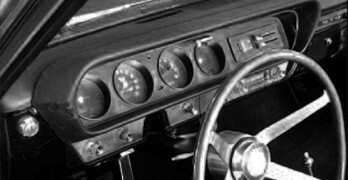 Removing the cut-down front and rear glass and moldings was particularly difficult, not only because these 50-year-old components were custom-made and delicate, but also because they wrapped around the original Carson headliner, which Jim kept in the car. So the variables in this non-typical Junior paint job included much careful masking and sanding in and around the window-opening areas, both to prepare them for paint and to preserve the non-removable portions of the upholstery (i.e., the headliner). Then, once the doors and hinges were removed, they fully masked the entire door openings to keep any paint out of the interior. This F-100 should have been stripped of several paint jobs when I got it 20-some years ago. This time it needed some rust holes patched in the lower doors and a new front fender. The plan was to fix and spot-paint these areas. As you can see, that plan has gone awry. Note that even for dry sanding I’m wearing gloves to save my hands. This is how far apart it got. I masked off the interior, engine, and parts of the firewall to paint and rub out the cab. Then, after more cleaning and sanding, I used semi-gloss and gloss black spray cans to paint the frame and chassis parts before putting things back together. The rear window stayed in because its rubber seal holds the headliner on the inside, which also didn’t come out. The hood needed some serious sanding before getting repainted yellow inside and out. 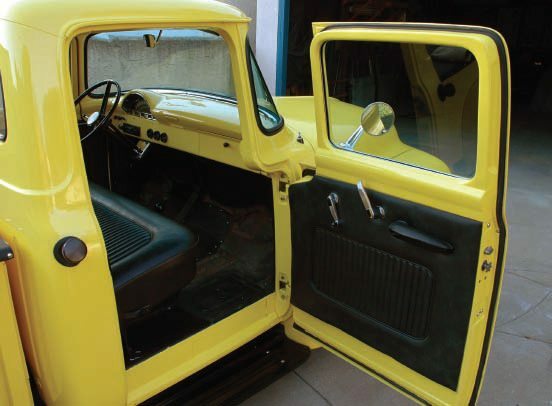 The doors were painted with everything out of them, as were the cab jambs. So not only are the jamb areas sanded and rubbed out smooth, but all the bolts, screws, latches, strikers, and weatherstrip are new or freshly plated. These small details take a lot of work, but make a big visual difference. At right is the finished truck. 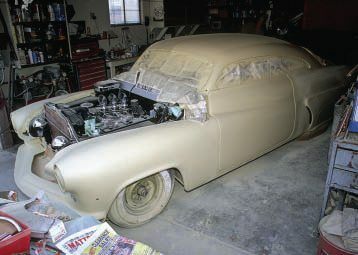 Fortunately, the design of the ’51 Mercury firewall and inner fenders allows for relatively easy masking of the entire engine and engine compartment. Junior also masked off exposed parts of the already-detailed frame, including under the rocker moldings and in the wheelwells. 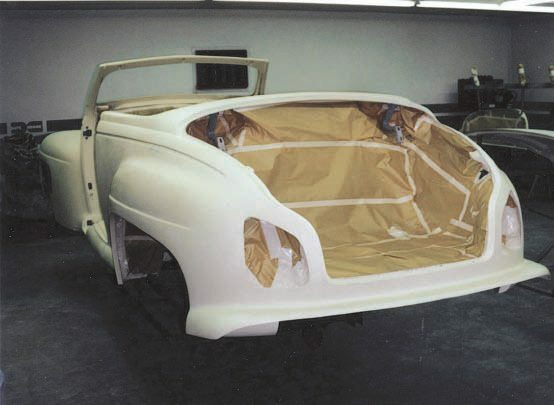 The fact that this car was being painted in lacquer, rather than catalyzed enamel or urethane, made a big difference in terms of reducing overspray problems. 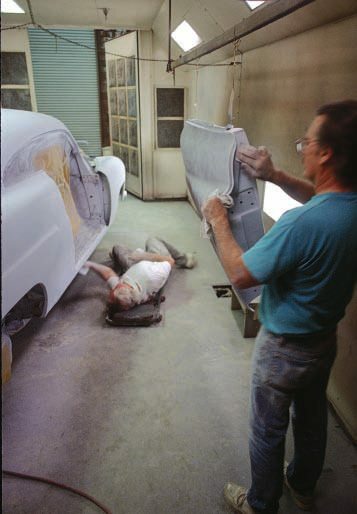 The point of this chapter is to show that if you want the highest quality paint job everywhere on your car—meaning in the doorjambs, around windows, in the trunk, and so on—it’s not only necessary, but actually easier in the long run, in terms of sanding, priming, blocking, spraying, and even rubbing out the finish, to remove the doors, trunk, hood, glass, and most everything else that comes off the main body of the car, including the front fenders in most cases. But you don’t necessarily have to remove the body from the chassis to paint your car as well as this very famous show car. 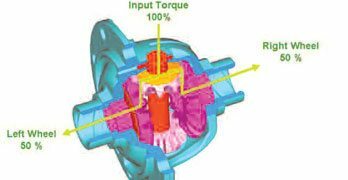 Most of this applies to older cars more than new ones, which not only have all sorts of electrical stuff in the doors, but really require a shop manual to tell you how to remove window glass and other such components. 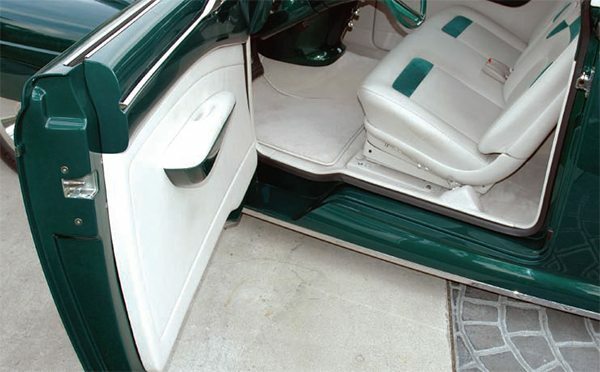 If you’re doing a color change on a newer car, you’re going to have to paint areas such as doorjambs. But you have to decide whether the work involved makes taking the doors off and glass out worth it. On newer cars, the paint in these areas (i.e., doorjambs) should be in good shape, requiring primarily a good cleaning and scuffing and possibly a coat of a high-adhesion sealer before repainting. But on older cars paint is probably scratched and chipped, if not peeling or rusty, in such areas, and going the extra step of removing doors, etc., makes sense. you’re going to have to paint areas such as doorjambs. But you have to decide whether the work involved makes taking the doors off and glass out worth it. On newer cars, the paint in these areas (i.e., doorjambs) should be in good shape, requiring primarily a good cleaning and scuffing and possibly a coat of a high-adhesion sealer before repainting. But on older cars paint is probably scratched and chipped, if not peeling or rusty, in such areas, and going the extra step of removing doors, etc., makes sense. 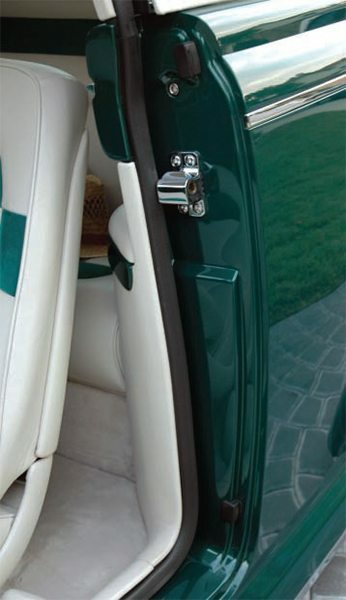 Door, hood, and trunk hinges are all adjustable in several directions. 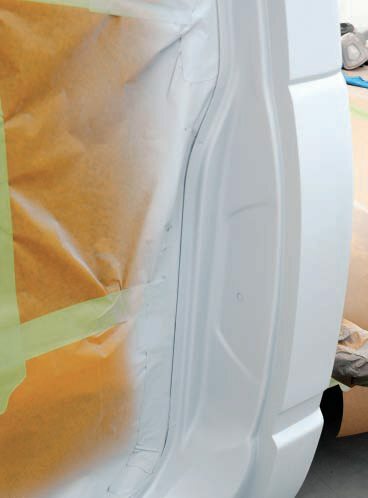 Fenders and other bolt-on body panels are usually shimmed to fit properly when the car is first assembled. Depending on the age and brand of vehicle, the assembly line guys might have gotten everything lined up well, or might not have. And if the car has been hit or worked on in its life, who knows who has shimmed or adjusted body parts since it left the factory? Here’s another pickup undergoing a similar paint job, but to a greater degree and on purpose. 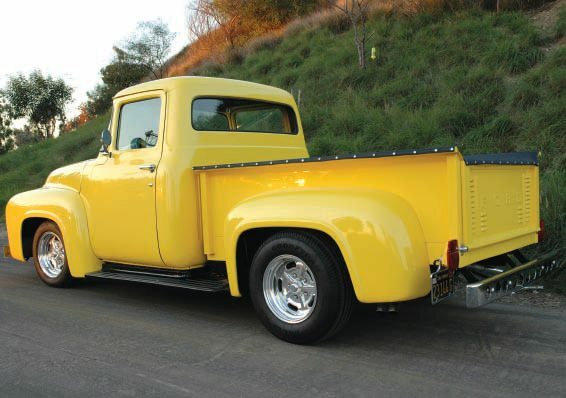 Dave Crook has been working on this redesigned and customized SS-454 Chevy for a few years in his spotless home garage. 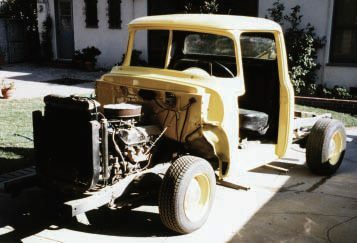 While the cab is still on the frame, the dash is in it, and the running gear is all in place, Dave started this one by taking everything to bare metal with liquid stripper. After making modifications, doing bodywork, and lots of blocking with high-fill primer, these photos were taken just after his final primer coat before paint. Here’s a good look at how a well-finished doorjamb should be prepared. 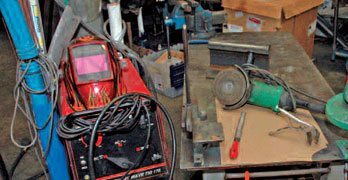 Since this was a long-term project that required metalwork on most body panels, as well as blocking and painting, Dave built sturdy custom stands to hold the parts while he was working on them. It’s a lot smarter, and ultimately easier, than chasing a loose fender around the garage floor. In this photo, besides the easily accessible parts ready to paint on racks, note the exhaust fan Dave installed in the wall of his recently rebuilt backyard garage, plus the large pieces of masking paper he has taped to the wall next to it. Since he’s now ready to shoot color, these are used to test his spray gun on as he adjusts the pattern. Smart. The doors are bolted (at the hinge locations) to an adjustable, roll-around rack of a type that used to be common in body-and-paint shops, though Dave built this one himself. Let’s assume, to start with, that the panels on your car fit properly. After you remove and paint parts like doors, then you have to get them back on in exactly the same place. A simple trick most people won’t notice is to drill about a 1/8-inch hole through each half of the door, hood, or trunk hinge, into the panel it bolts to, before removing them. When reinstalling a door, for instance, first bolt the hinge loosely to the door-post (on the body), and insert a 1/8-inch drill bit in the hole, and move the hinge until the bit slips through the corresponding hole in the post. Do this with both hinges. Then (with at least one helper), attach the door to the other half of the hinges, and align them the same way. Snug up the bolts and carefully close the door to see if it fits properly in its opening. It should be pretty close if you’ve used the drill bit trick. 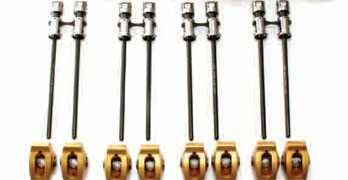 But given the adjustability of most hinges, you can move the door forward or back, up or down, and in or out at the top, bottom, or both, until the gaps between it and the body are all equal. 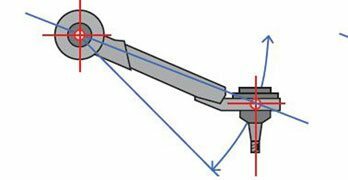 The same is true, more or less, of hoods and trunks, and in all cases the latches (strikers and dove-tails, if they have them) must also be adjusted to hold these parts in the proper alignment when they’re closed. If you’ve installed new rubber bumpers or weatherstrip seals, it might take a while for these to compress to get doors and other parts to close fully and properly. Or they might have to be trimmed or adjusted a little themselves. 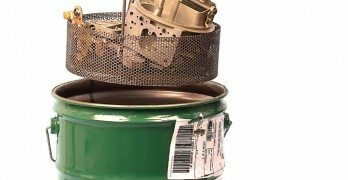 When removing panels such as front fenders that have shims in them, save and mark the location of these so they can be reinstalled in the same place at the same thickness to start with. Shims can then be added or removed to fine tune the fit after the parts are painted and replaced. Obviously, not scratching freshly painted body parts while reassembling them is paramount. 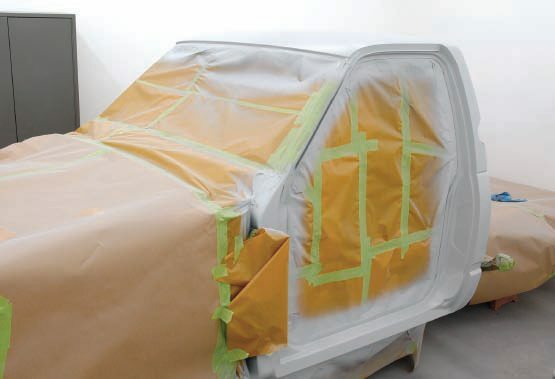 A good precaution used by many painters is to run masking tape along the edges of both parts (such as the hood, cowl, and fenders), where they might touch. Just be sure the paint is dry and cured enough that removing this tape won’t pull off any fresh paint. This is where a less-sticky type of tape like the blue stuff is preferable. Another old painters’ trick is to use paint stirring sticks (or pieces of them) as wedges between doors and body, fenders and hood, and so on, to align them before tightening hinge bolts. They’re made out of soft wood, and they’re just the right thickness for most body gaps—about 1/8 inch. But reassembling auto body components properly is something of an art that takes some practice and experience. Learning how to do it with all freshly painted pieces is not a good idea. We strongly suggest that you do some practicing before you paint. 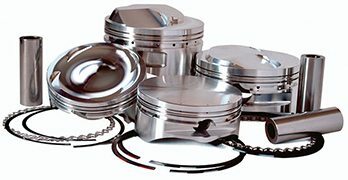 At the least, loosen hinge bolts and fender attachments, and make sure that you can get everything to line up properly. Even if it all looks perfect to start with, loosen it all up, get it out of alignment (see which way things move), and then try to get it all straight again. Next, I’d suggest—assuming you plan to do the doors-off/glass-out level of paint job anyway— that you take the car apart before you start the sanding or strip-ping process. It’s much easier to sand doorjambs when the doors aren’t in the way. 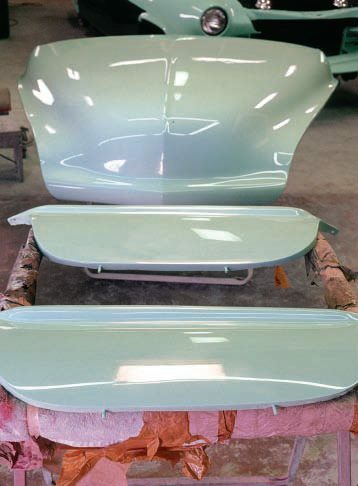 And it’s easy to sand and prep the inside of a hood or trunk when it’s loose and upside down—same with spraying paint, and even color sanding and rubbing out. That’s the reason for this stage of paint job. It’s ultimately more work, altogether, but it actually makes the job easier—and usually better. It’ll be a while yet before Dave’s done painting the pickup. 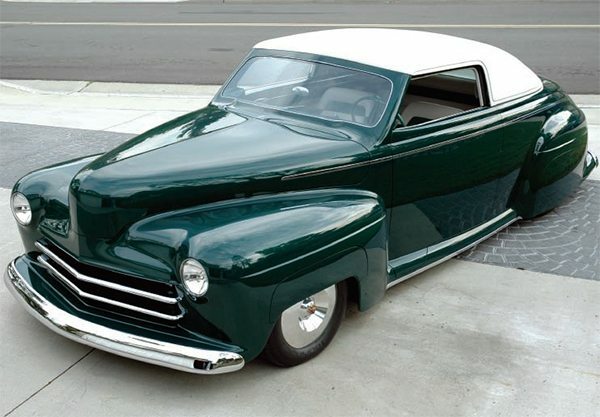 But he did have some in-progress photos of his last, now-finished project: a full-custom ’47 Ford convertible that you would have to see in person to fully appreciate. This one was built body-off-frame, with all parts initially chemical-stripped in submersion tanks. 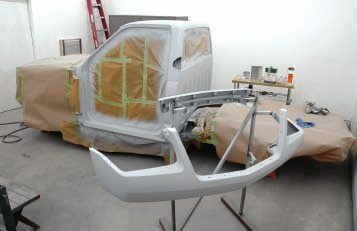 At this point Dave has welded and leaded the fenders, splash aprons, and other parts to the highly customized body, which has been metalworked and is now coated in high-fill primer for blocking. 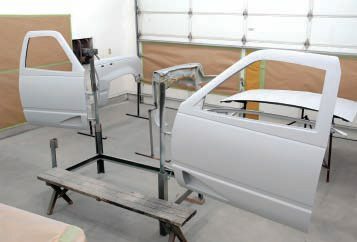 As with the pickup, Dave made custom stands and racks from tubing to hold all the various body parts for working and, ultimately, painting. You can see that this work is being done in his home garage. The body required a pretty hefty jig, which Dave mounted on a roll-around dolly for convenience. 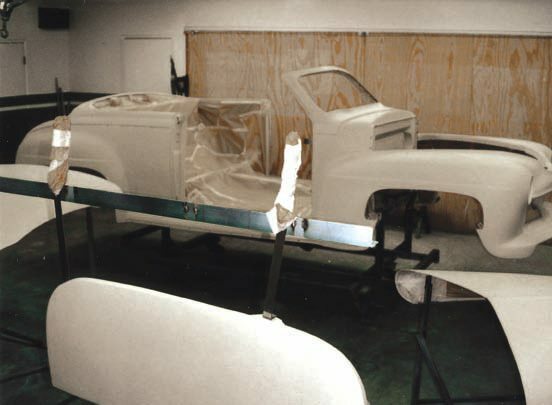 In this photo the body has been painted, color sanded, and rubbed-out, and is ready to be set on the completely finished and detailed chassis. The completed car—painted in many coats of jade green candy over a white pearl base—is incredible, not only in its many unique design features, but even more so in its flawless body fit and finish. When it comes to sanding, painting, rubbing, and detailing doorjambs, you’re not going to find many better than this. And if it’s this good here, imagine what the rest is like. This car has rightfully earned its share of show trophies and magazine covers. But it was built and painted by its owner in his backyard garage. Sure he’s got years of experience now, but that’s where he started. Have you been practicing? As far as glass is concerned, this is one of those classic “it’s a lot easier to take apart than to put back together” situations. On older vehicles that have rubber moldings around the windshield, back glass, and sometimes things like side quarter windows, we assume that you want to replace these with new, fresh rubber, which is available for most older vehicles these days. If so, the easiest way to get this glass out is to cut the lip off this rubber seal with a razor blade or X-Acto knife, all the way around, on the inside, and just pop the glass out. 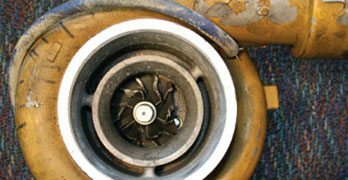 If, by any chance, new rubber isn’t available and yours is reusable, you can carefully pry this lip, from the inside, over the metal edge of the window opening, with a dull putty knife, or preferably a similar tool made of plastic, being very careful not to cut or tear the rubber. On the other hand, if new glass seals aren’t available, and yours is brittle and prone to cracking, maybe you should leave it and the glass in place and paint around it. Do this only as a last resort. Taking roll-up side windows out is a more mechanical operation. When removing the glass on an older car, it’s very wise to remove the felt channels and fuzz strips as well, because they should probably be replaced with new ones, and they’re no fun to try to mask off. Finally, once you get everything sanded, primed, painted, rubbed out, and fitted all back together, I strongly suggest you take the car to a good glass shop to have all the glass, rubber seals, channels, trim strips, and so on, replaced. You could do it at home—especially the side glass channels and so on—but we’re not going to cover all that here. I’ve done it myself in the past many times, but it’s taken me many years to realize it’s so much easier (and not really that expensive) to have a good professional auto glass guy do it, in his shop, with the proper tools and experience to fit things right the first time. The natural sequence is to have glass reinstalled once all the paint and rub out is finished, then the upholstery after the glass. 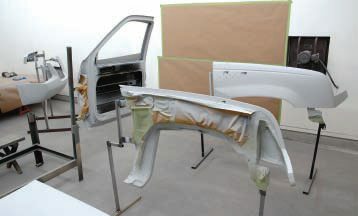 However, on some vehicles there is some interface between upholstery and glass installation, especially in terms of headliners and sometimes with windlace or weatherstripping. 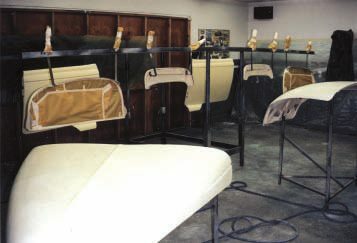 So check with your upholsterer to see what should be done first on your vehicle.